Victory Motorcycles is an American motorcycle manufacturer owned by Polaris Industries. 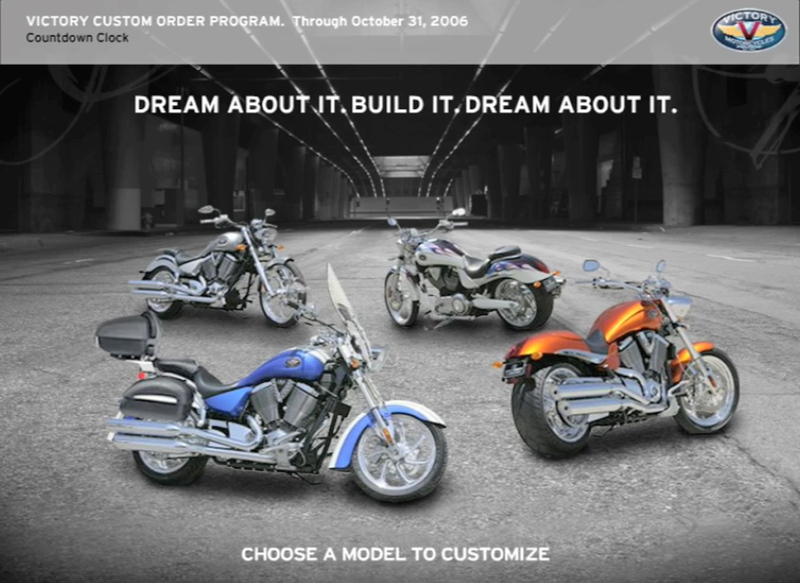 Victory motorcycle wanted to create a configurator that enabled their customers to design their own motorcycle online. This was Victory Motorcycle’s first venture into product configuration so they turned to us to help them build their first configurator. The application featured world renowned custom motorcycle designers Arlen and Cory Ness. We traveled to California and shot custom footage of Arlen and Cory and added it to the website. The configurator enabled customers to select options which included model, color, wheels, engine and frame color, chrome, headlights, handlebars, etc. Once configured, the customer was presented an image of their finished bike and the total price. In addition they were encouraged to visit their local Victory Motorcycle dealer for a test ride. The configurator was such a resounding success, that Polaris asked us to help them build similar configurators for their ATV, snowmobile and Ranger utility vehicles.